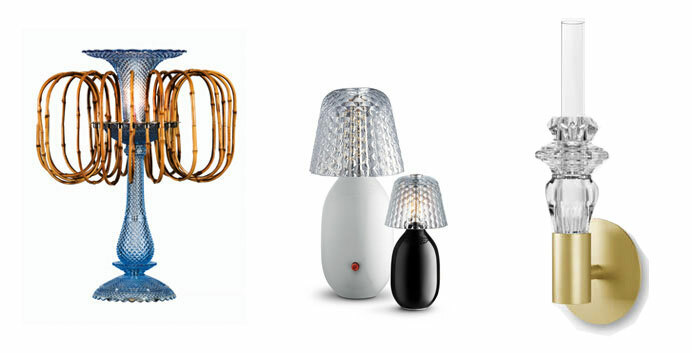 A selection of chandeliers and lamps lately unveiled at the Milan Furniture Fair this year, including one by the Campana brothers combining crystal chandelier “Zenith” with bamboo. It takes eight weeks to receive a luster that comes in pieces, carefully arranged in wooden boxes. The latest achievement presented at Designer’s days in Paris: the iconic Harcourt glass, originally called “service Gondola triple button” transformed by the students of the Swiss school, ECAL, a wall lamp here. And the adventure continues in a beautiful way. To visit until November 10th, 2013, the exhibition “Taillé sur mesure” in the chapel of the Manufacture in Baccarat, led by Michaela Lerch, curator and director of the Heritage Service. To discover on October 16th 2013, the book “Baccarat-250 years” with texts by Laurence Bennaim and Murray Moss, published by Rizzoli New York.